June was a month that mostly consisted of finishing an app and then releasing it along with a bit of a positive distraction towards the end. Quiz of Finance & Investing was released on June 22 but a lot of work went into the app before that in June. When I first started working on design for this app I thought about and worked on a few different dimensions to go for but I eventually firmly decided to go with a standard stock trading screen as the main design influence. Stock trading screens involve a lot of green and red to track gains and losses and moving parts so I incorporated some of that throughout the app without making it distracting from its main focus as an educational app. One of the first things I concerned myself with was finding a text font style that had a professional & computer related look. After looking at a lot and testing a few I ended up going with two different fonts. One mainly for the quiz section which was more standardized and then one for other sections of the app that had an LED dot style. I remember seeing a neat stock ticker banner outside in New York City the last time I was there a few years ago and it had the LED dots type of font to show the stock symbol, numbers & etc so I felt great going with that type of font for the non-quiz sections of the app as well as the promotional images to help drive the stock trading design goal. After picking a font and deciding on the main colors to use throughout the app I made buttons and static text sections. After incorporating the buttons and other text areas I gave the main screen subtle animations to make it appear active and alive like stock trading is during the open hours because of the constant trades and reactions. So on the main menu screen I incorporated randomized movements to the bar buttons that the categories are placed on. The main menu was also the first place that I incorporated the moving ticker at the bottom. I did a lot of testing with the ticker to make sure it looped without overlapping but also somewhat recycled itself to prevent any bog down on the performance of the app. This app doesn’t need or require an internet connection so I didn’t want that to change at all for a cosmetic addition, so I just incorporated some historic data for that ticker to pull from for the main menu. Then on the results screen I added a ticker that gives the results. The results are shown as the focus on the center part of the screen so the ticker is just there to add to the overall design of the app. The last place I added a ticker was on the Statistics screen that repeats the results that are shown in the statistics table. Which brings me to one of the main additions I added in June. The Statistics section that tracks how many questions you’ve answered in each category along with the correct amount answered and percentage correct. I also incorporated an erase option to wipe the slate if the user wants to. I used the same features in my RX Quiz of Pharmacy app so I was able to reuse a lot of code which was very helpful and efficient when working on this feature. I mainly had to pull the data from differently named sections that were loaded into the app and change around a few numbers since the question count options are a little different in this app. I also added a green/red delegation that depends on if the percentage correct is above or below 50%. After implementing all the data and design within the app I worked on sound effects. This app isn’t audio heavy so it didn’t take long to finish this aspect. I knew I wanted computer related & breaking news style sound effects so I went into GarageBand with those intentions and created some audio to incorporate. The last aspect of finishing the app build for me was making an icon. I usually wait to make the app icon towards the end of the apps development because by that time I definitely know what the app is about and how I want it represented. I’ve written about the importance of a well represented app icon before and there are plenty of other articles about that as well. At this point of the app process I had the design of the app cemented freshly into my mind so thankfully it didn’t take long to create an app icon that I was happy with. After finishing the icon I tested the app on different devices like usual. I only ran into a couple of functionality bugs and they were easily fixed. I also tested the visibility conditions to ensure the text sizes were adequate for the different categories since they each had a variance in the lengths of the questions & answers. I ended up adjusting the text sizes so they are different but more fitting depending on the category chosen on the main menu and throughout the changes in an Assorted category quiz. After completing a release ready build I uploaded it and worked on descriptions, metadata, screenshots & etc. After my new app was approved and went live I spent a few days relaxing. It’s deserved! Then while I was on the Amazon developer portal a few days later to change some keywords I noticed an Alexa skill promotion that stated that developers who created a new skill that passed certification in June would receive an Echo dot. I remember seeing this briefly in an email before but this time I thought about it as a challenge. Voice recognition software is neat, I like Amazon as a company, the Echo devices are intriguing, I recently successfully completed a new app and I was up for the challenge of learning and trying something new. So I challenged myself to make a skill in one day. I went through a couple of skill ideas and then quickly decided upon making a Game of Thrones related skill because its my favorite TV show and season 7 is coming out in a few weeks! I worked on the skill off & on through the day and stayed up late to finish it. The first thing I did was scour the internet for quotes as well as implementing some of my favorites on a spreadsheet. Throughout development I used a template provided by Amazon and a couple of different articles which were mostly helpful. After having a somewhat finished product I went back and forth with testing until it worked as intended. I got stuck on one part were Alexa would just keep responding with the phrase I gave her to say when she doesn’t understand a request. Eventually I found the error on my part, fixed it, and then the skill worked fine. The first certification review was rejected because my example phrases had an incorrect format which thankfully was an easy fix. 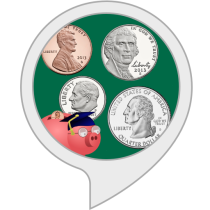 After changing those and re-submitting it my Alexa skill passed certification and went live. Overall I made the skill within one day and it was approved within two. 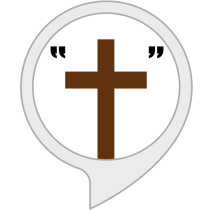 This is my first Alexa skill and it’s called Quotes of Game of Thrones. I recently received the email about receiving my Echo Dot too so I should be getting that sometime soon in July. Learned some new things, got a result I’m satisfied with, and I’m getting a neat item for free. Awesome! I may or may not make another Alexa skill down the road, not exactly sure either way right now. Towards the end of June I decided that I wanted to make a simple to the point trailer for my new Quiz of Finance & Investing app. I probably should have done this before release but oh well. I used Reflector 2 to record the screen on my iPhone to capture different question scenarios from my app so I could pick and choose during final editing in iMovie. After I finished gathering different screen captures I worked on the music. While in GarageBand experimenting I believe I got influenced by a combination of Daft Punk and school marching bands because that’s what the end result of my trailer song reminded me of. I was really satisfied with how the song turned out. It makes me want to move and it has a nice orchestral feel to it. Overall December was probably the month with the least amount of app development in 2016 for me. I spent more of my little app dev free time doing other things like playing video games and catching up on some TV shows. Also, Christmas is my favorite holiday so some of the month was spent doing things related to the holiday. This is the first year since my first release in 2011 that I didn’t release a new app. Something like 97% of the app dev work I did this year was devoted to updates. I like my older apps especially some of the ones I updated this year, but I did get a bit burned at times from not working on much new material. Regardless, in December I updated one of my most popular apps and continued to work a bit on my new app. A few months ago Apple implemented stricter App Store Review Guidelines that involved probing the app store for old apps that haven’t been updated in a few years, apps with titles too long, and more. Once your app falls into at least one of those categories Apple sends you a nice notice that your app does not comply with one or more App Review Guidelines. Then for more details it advises the developer to go to the Resolution Center in iTunes Connect. Upon doing that you’ll find out why your app was targeted. So far, the four of my apps that were targeted were because they haven’t been updated in years. Even if the app still works perfectly fine like mine did, Apple still wants you to update. So to resolve the issue and prevent Apple from removing the app from the App Store I had to submit updates. This actually happened to three of my apps last month and I decided to update two of them, and let one make its exit from the App Store. I actually forgot to write about it in last months progress post so I’ll write about on this post. Last month my apps Detective Deep, Strike the Goal, & Raven’s Hidden Hollows received a notice from Apple basically about not being updated in a while. All of these apps worked fine and as intended so the updates I submitted to keep them on the app store were mostly just time consuming. Instead of just giving a blank update though I made a few adjustments to Detective Deep & Strikes the Goal which resulted in faster load times, 64 bit support, & some image enhancements. These adjustments weren’t necessary or needed right now, but since I had to use some of my time to do an update in general I decided to add a bit more time to actually make some minor improvements. 64-bit isn’t a minor issue, but luckily the task of supporting it is currently a minor thing for me to update for. I decided not to update Raven’s Hidden Hollows though because I no longer liked the presentation and gameplay of the app specifically. I also removed the app from other stores for the same reason. I should have added a story and maybe some puzzle elements to the app, but instead of adding those to an old app I decided to just remove it, and if I decide to make an app like it in the future I’ll add those features. 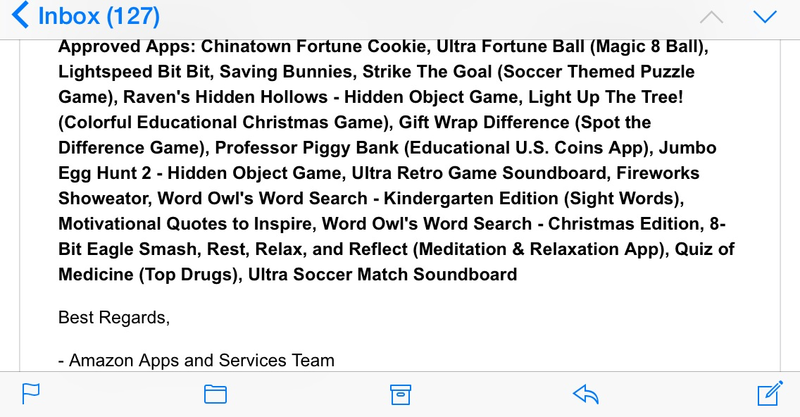 The only hidden object games without a story that I want in my app portfolio right now are my Jumbo Egg Hunt games. Which brings me to the update I had to make in December. During this month Apple sent me the same notice mentioned earlier about my app Jumbo Egg Hunt. This app is one of my most downloaded older apps combined across all app stores and I like it a lot so updating it to avoid it being removed from the iOS App Store was imperative. Again, instead of submitting a blank update I decided to make a few improvements which included; 64 bit support, image enhancements, and faster load times. Since I was updating the iOS version with improvements I went ahead and updated the Android versions as well on Amazon & Google Play. New apps are on the horizon, but first a couple of updates…. Crunchy Numbers Math Arcade received a minor update that improved the tweet feature to automatically input the hashtag(#CrunchyNumbersMathArcade) for the game in the editable tweet text box. The process of uploading the new build(and of course waiting on review period) took longer than the work in the actual update itself. Most players never tweet scores and I don’t think many people will use it in this game, but I wanted to do it because this is one of my favorite apps I’ve developed so it gets spoiled. Motivational Quotes to inspire received a nice update. More info on it can be found on the Motivational Quotes to Inspire 1.5 Update post. One of the main changes in the new version was a minor update to the Settings section layout as seen below. In August I also worked a lot of my new pharmacy quiz app which included a lot of research, heavy work with tables, & UI design. I’ve started to use the Paper app along with the Pencil stylus to mock up UI designs. Working on an interfaces in a drawing app is really neat. I can quickly change things to roughly see how it will look on different devices and also test if it’s user friendly for the users hands. One of the first main menu iterations can be seen below, the finished version is still incomplete. There’s been a lot of work going into this app. I’ve been able to use a bit of data and some code from Quiz of Medicine, but a lot of the new app is being built from of the ground up. 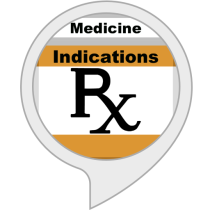 This new medical app will focus on the top 200 drugs in 2015 for the medicine portion of the quizzes whereas Quiz of Medicine focused on featuring over 400 different medications. My new pharmacy app will include brands, generics, indications and drug class quiz types like Quiz of Medicine, but it will also include a couple of new quiz types as well. This will be a very focused well rounded pharmacy app for students and various people in different medical positions. 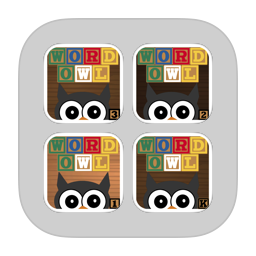 During August I also started to compile a list of words for my new Word Owl’s Word Search app. This will be the Halloween Edition so the overall design and words will be of course be Halloween themed. This app will be completely kid friendly so there will be no horror images or shocking words. I’ll be putting my medical app aside and working on this app more in September because I plan on releasing it during the first week of October. July was an all over the place month in app development land. Worked on new apps and updates to previously released apps, and then there were even some updates to updates. This is what happens when I develop without a clear organized plan…..
During the beginning of the month I worked on my new relaxation app. I continued tidying up the UI that I’ve been working on previously, and then I started implementing logic. As I was deep into development logic I released that I may not be able to finish this app this year because I’m not sure if I’ll be visiting a beach this year. No, that’s not a typo or a mismatched sentence. I really want to incorporate beach sounds in this app, and I want it to record them myself like I’ve done for various other sounds that will be in this app. This app will have a heavy focus on sounds and I want the sound of the beach & ocean to be a segment of it. So the conclusion of this little tangent is that I’ve decided to stop development on this app until I’ve gathered and edited all of the main sounds for this app. I’m still really interested in working on this app and I can’t wait to release it, but I feel like I would prevent a lot of backtracking if I have one of the main focus points of the app finished before I get too deep into implementation of rules, attributes, and other developmental aspects. During the middle and end of the month I worked on several updates to previously released apps. Some of them were minor and some of them were more substantial. Gift Wrap Difference, Light Up The Tree, & Zompy Jumpy all received 64-bit support updates which also decreased loading times. Right after the Light Up The Tree update was released I realized that I needed to fix a couple of links within the app. So I quickly fixed those issues and published another update which is currently waiting on review with Apple. After the Zompy Jumpy update went live I realized that I forgot to include a pre-typed hashtag within the tweet feature. I know it’s a very minor mishap that can even be added or deleted by any user, but I’m really into minor details. Usually the minor details I may revisit pertain to graphics, sound, or code, but this time it was a preloaded tweet. Yea kind of ridiculous, but I should have noticed it during the initial update I did this month. If I would have been more patient I could have avoided these two back to back updates. The latter two updates were minor but they were still time consuming in a month were I didn’t have much app dev time to consume. I’ve learned my lesson from these mishaps though and hopefully I’ll avoid these similar situations in the future. In July I also worked on the Fireworks Showeator 1.4 update. More info on the update itself and the reasoning behind a part of it can be found on the linked post. Fireworks Showeator also received a minor iOS update after version 1.4 went live that was similar to the additional update that I submitted for Zompy Jumpy. Last month I also finished my newest game. It’s a quick fast paced arcade game that I initially created during a space themed game jam. After the game jam I put it off for a while and went back to working on other apps. I recently decided to revisit the game, finish it, and release it on the Apple App Store. I may end up including the main gameplay of this game into a larger game in the future so I want to see how it’s received by the public. Most of the game has been finished for a while, but in order for me to feel fine with releasing it on the App Store I wanted to add a leaderboard and fully test it on different devices. So in July I incorporated Game Center leaderboards, added a main front screen to prepare players for the challenge, and then I tested it on different devices. The game has actually already been in front of you multiple times, but it’s just waiting on August 8th…..that’s a really lame inside joke that will make more sense when it’s released…. Recently I discovered that people were starting to get errors when trying to post a tweet from within some of my apps. So after doing some digging I found the same bug within all of the apps with twitter integration, fixed them, and submitted updates to Apple. All of the apps affected now have live updates on the Apple App Store that resolve the problem. Also, now before you post a tweet from within any of the apps you’ll be able to edit it and add words, hashtags, emoticons, & etc. 2013 was a year of great forward progress for my old and new apps. Some of my older apps received updates that improved their performance, and some of them received updates that added content and/or features. In 2013 I also went from being in three app stores to being in five by expanding into the Windows and Barnes & Noble app stores. My app development time in 2013 was all over the place. Porting apps to new app stores, updating apps with improvements, and developing new apps that were released in 2013. Definitely a busy and successful year. 2013 wasn’t by any means perfect though. I had a few set backs in development, and some of my apps didn’t perform as well as I thought they should. Marketing is still the hardest aspect to grasp in the mobile apps business for me. I still plan on concentrating mainly on the app itself though because if the app isn’t great it doesn’t matter much if the marketing is good. However, I did release some of my best apps ever in 2013, and some of them performed very well on some of the app stores. 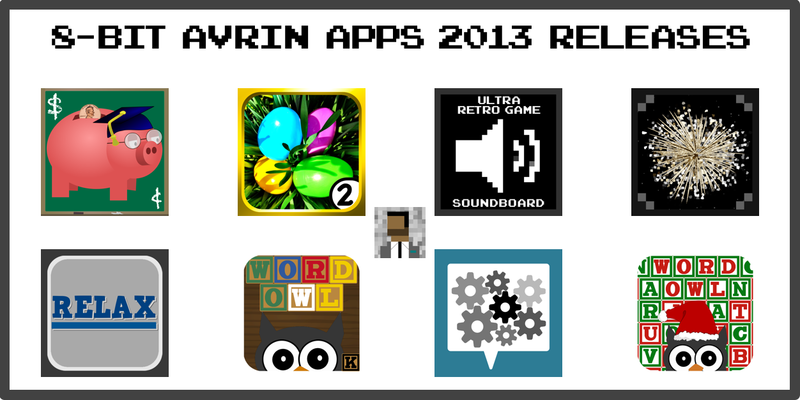 I’m very pleased with most of my new apps and the outcome of 2013 overall. I’m learning from mistakes I made as well as learning & thriving on the positive leaps and bounds I made. My development and design skills are continuing to improve greatly and they’ve shown through the apps I released in 2013 on the inside and outside. Amazon and Apple continue to be the best outlets for my apps. However, things started off fairly bright on Windows and Barnes & Noble was definitely a nice addition for my apps. Below I’ll list the top 5 countries where I received the most downloads and my top 5 apps that were downloaded the most. As usual I won’t be posting any specific numbers because I don’t do that. I’m not rich though so don’t get that idea. I’m planning & working on some great things for 2014 and beyond when time permits, and I can’t wait to share more info on them. I want to give a big THANK YOU to everyone who has downloaded any of my apps, and another big THANK YOU to the people in my life that have been supportive. I develop apps for you random people out there and because I have a bunch of ideas that pop in my head that I need to eventually get out. Have fun! 8. Rayman Jungle Run – I haven’t played a ton of them but it’s the second best endless runner mobile game I’ve ever played. Jetpack Joyride is still number 1, but I didn’t play it as much as this game in 2013. Great visuals with a sharp art style. Controls are simple and they work very well. 7. Wordament – I actually don’t play many mobile games, mainly due to lack of time. I usually play console games when I have time to play games at home. However, Wordament is a really neat app that I had fun jumping into when I had a few minutes to spare while waiting somewhere and etc. 6. MLS Matchday – This app helped me stay up to date with the happenings of this past Major League Soccer season. It’s also received a nice update that made it more functional. 5. Epocrates – Great health/medicine app. I also use it to help myself learn more about the medicine I’ve learned about in school. 4. Twitter – It’s the social media outlet I use the most and it’s an excellent source that I use to find interesting articles about technology, health, video games, finance, science, and etc. It’s received a few prominent updates that have moved it forwards, but also backwards a bit in some areas. 3. Clear – My favorite to-do list app. Neat, efficient and simple. 2. Camera + – Easily my favorite photo editing app. It’s also been improved greatly throughout last year with new updates. 1. Spotify – Great app that does what it needs to do. This free service lets me listen to a ton a different music without using up a ton of space on my phone. I use it in my car, in the gym, at work, at home, and etc.